Tired of stacking wood, cleaning up all the mess, and the time it takes to get a fire started? Converting from wood to a gas could be the perfect option for you. It is a big decision to make and you want to make sure you make the right choice, that’s why it’s important to have a trained, certified professional to answer all your questions and help guide you through the process. Combine the fun of a fire pit with the convenience of a patio table. Outdoor Fire Tables are a highly functional outdoor fire feature, adding a warm, cozy space for your friends and family to gather. 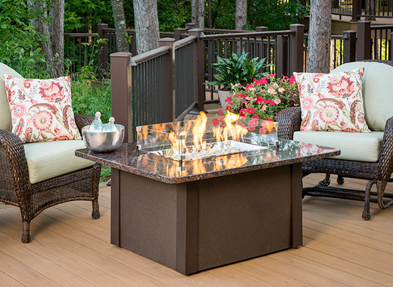 A gas fire table is the perfect focal point to your outdoor living space. Our outdoor fireplaces are the idea way to transform your backyard retreat with a stunning, dramatic statement. From traditional to contemporary, add beauty, warmth and charm to any spot in your backyard. From chimney sweeping and inspections to replacing broken valves and repairing leaky gas lines – our team of CSIA and NFI certified professionals are the ones to count on. Our commitment to the fireplace industry and our customers has continued to be strong throughout the 25+ years we have been in business. We want you to be happy with every aspect of your experience with us. Why choose wood? One of the nicest places to be during the cool winter months is in front of a fireplace or stove. Nothing beats the smell or the memories of a classic, crackling roaring fire. Wood burning not only warms you to your bones, it offers the beautiful dancing yellow flames and orange and red hot coals. 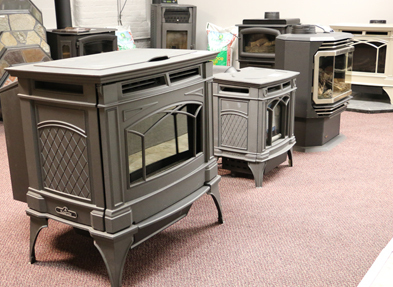 Long before we had an actual hearth shop for you to visit, Anderson’s Chimney (Anderson’s Coal Energy) had been selling, installing and servicing top of the line fireplaces, inserts and stoves. As the nights turn cool, you can still enjoy the outdoors with an outdoor fireplace, fire pit or fire table. Our outdoor fire collection is the perfect accessory to your back yard. 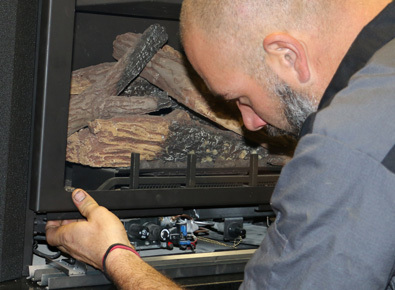 Manufacturers recommend annual maintenance on your stove, insert or fireplace by a trained, professional. Regularly scheduled service will enhance the life of your appliance, keep it burning efficiently, save on costly repairs and provide you with peace of mind.